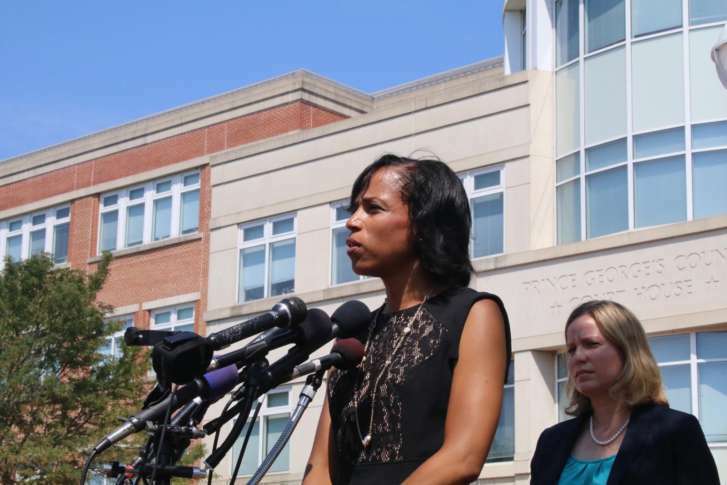 Angela Alsobrooks, the State's Attorney for Prince George's County, addresses reporters in this WTOP file photo. (WTOP/Kate Ryan). Prince George's County State's Attorney Angela Alsobrooks announced on her Facebook page that she was running to replace Rushern Baker as county executive. WASHINGTON — The field of candidates for the next Prince George’s County executive just expanded. She had been expected to make an official announcement on Monday, but signs started to pop up on social media before her official announcement. Alsobrooks was the first full-time prosecutor in Prince George’s County’s State’s Attorney’s Office dedicated to handle domestic violence cases. A Democrat, she joins a race that includes State Senator Anthony Muse. State Board of Elections records indicate Lewis S. Johnson has also filed to run in the county executive contest. Former Maryland Congresswoman Donna Edwards’ name has also been floated as a possible candidate. Current Prince George’s County Executive Rushern Baker can’t run because of term limits. He is running for governor. The Maryland state primary is next June. In heavily Democratic Prince George’s County, the winner of the primary contest can usually count on winning the general election.